One of Seremban's few halal Chinese cuisine spots to hit back in the days. In his childhood, Mr Foodpacker and his family spend their weekends finding for good restaurants to have dinner at. Given the limited restaurants available at that time, they were lucky enough to find this restaurant at the end of an unexpected alley. Since then, the whole family kept coming back to indulge in their tasty Chinese Muslim delights. Round table seatings: indoor and outdoor. They can pack more customers inside (air-conditioned) an it is preferably the better alternative as it is noisy outside due to the "active communication" between staffs at the beverage counter. They also have two types of aquariums: indoor and outdoor. The one you can choose and eat fresh fish from is outside =P. Operational hours: 10am-3pm and 5.30pm-11pm daily. Kailan with garlic and oyster sauce. RM12 (for 4 person). Fresh veggie. When it comes to greens, their cost to quantity ratio is pretty good. Not much taste, just pure, healthy veggie. Butter prawn (dry). RM30 (for 4 person). Their butter prawns dishes are the highlight of this restaurant. Noteably their dry butter prawns which is better than the wet butter prawns. If you're a fan of sweet egg floss, do request for extra, as they would normally come in a very small quantity. Butter prawn (wet). RM30 (for 4 person). Coated with flour and cooked with butter. The lack of butter gravy is a big disappointment. This dish is overall dry instead of wet, though the prawns pack quite a crunch. Venison black pepper. RM30 (for 4 person) Excelles better at taste then presentation. Well cooked and seasoned, with balanced amount of vegetables. Munchy and tender when eaten. A must order! Dishing it out: This shop serves a quality amount of chinese cuisines. Their chefs are highly qualified with some bearing experience from working overseas (China etc). But as time flies, so did some of their chefs. Even though they have maintained the quality of their food well, but the style of cooking seem to vary over time. Eg: Their wet butter prawn was once full of gravy, soaked and tasted much better than dry butter prawn, but it is now completely a different dish. Not only that, this shop seems to have a little problem with their serving portions. If you can see, ALL of the portions above do not match well with the number of people eating except when it comes to vegetables. This has been going on throughout the years. And it is even worst when you order for take away! Sometime you wouldn't even believe the amount of food you get compared to what you are paying for. Mr Foodpacker once ordered a meal for 6 people when actually only 4 people came by to eat (since he knows how stingy the restaurant is) but STILL it came out as if it was only meant for 3 people. Wonder how you signal "I WANT A LOT of food on my plate". 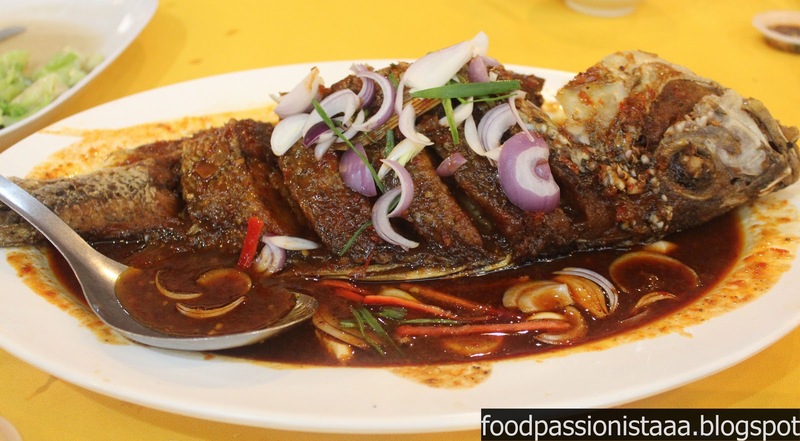 Though it lacks value for money, it is definitely one of the best and few Halal chinese restaurant in Seremban that is worth a visit. Salam kenal blogger seremban. me Sarawak - Seremban. hey i suggest you try ana ikan bakar petai in Bangi. Clean, and good choice of menu! n good taste! "LIKE" Mr & Mrs Foodpacker facebook page! !